מאת יובל ~ 14 ביולי, 2010. בקטגוריית: English, ארגנטינה, יין, יקבים, מדריכים. I woke up early and packed my small backpack for a couple of days. I walked over to the central bus station of Mendoza and paid for a ticket to Tupungato, the northern most part of Valle de Uco. After a couple of hours on the bus I finally reached Tupungato. I walked outside the bus station and looked at the town map. I walked over to the information center and received all the information I was looking for. When I came out I surprisingly met another tourist. Tim from Idaho was also interested in touring the area's wineries. While he went into the info center I went across the street to the lucotorio (phone booth) in order to try and make some reservations for today and tomorrow. I made a reservation for Bodega Salentein later on today. Now that we had somewhere to visit we had to find a place to rent bicycles, if there was such a place. According to the info center there was only one place to rent bikes, so Tim and I headed in that direction. When we arrived we found out that the owner rented all his bikes out to a big group of tourists. We asked him if he knew of another place to rent bikes and he pointed us in the right direction. 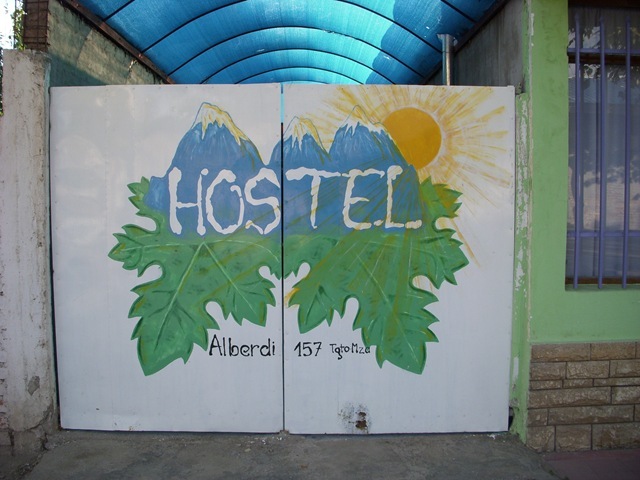 When we arrived at the next place we were disappointed to find out that the owner did not rent bikes. While discussing things with Tim outside the shop, one of the local residents came up to us and told us that he had 2 bicycles for rent if we wanted. We had nothing to lose by going to check out his bikes, so we climbed into his car and drove over to his house. Guillermo pulled out 2 mountain bikes in fairly good condition. We said that we would rent them for a couple of days and asked how many pesos he wanted for the deal. He said that he did not want any money. We were kind of surprised to learn that all he wanted was for us to have a good time and enjoy ourselves while in Tupungato. I left him my driver's license anyway and we rode off to find a hostel. We found one close to the central bus station and unpacked whatever we did not need for the ride. We looked at the map and started peddling towards the town limit and onto Route 89. 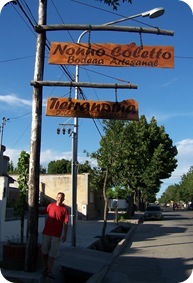 During the 10 km ride we stopped at a few bodegas on the way. First we rode into Sophenia which didn't have any tours or tastings. 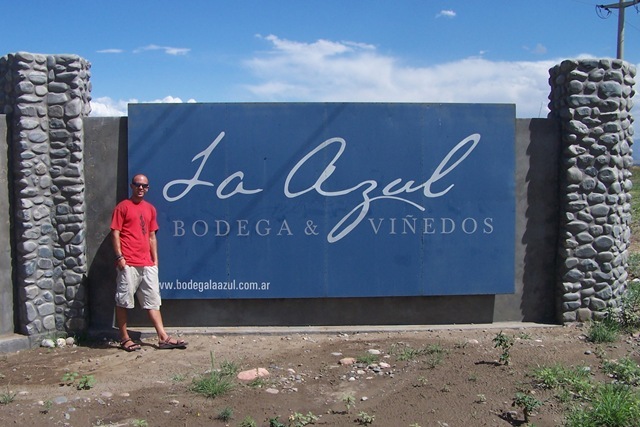 We saw Bodega Jean "something", La Azul, Andeluna (where we have a reservation for tomorrow), and Bodega Mayol. Bodegas Jean "something", La Azul, and Mayol don't have any tours or tastings so we just kept on riding. After an hour bike ride with many stops to photograph the amazing mountain scenery, we arrived at the winery at 14:30. We couldn't help but notice that we were the only ones who arrived on bicycles. 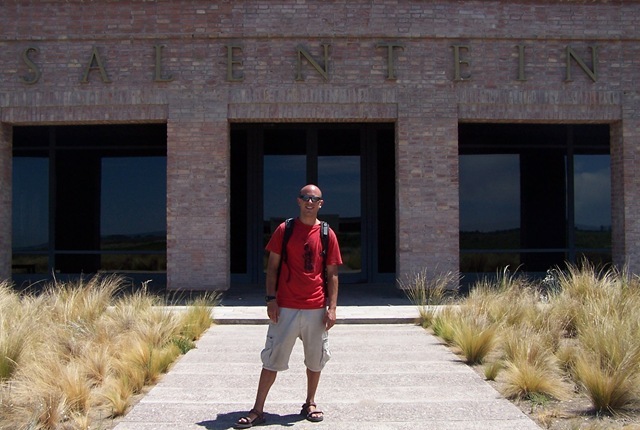 Bodega Salentein was definitely a place you wanted to arrive to with a vehicle, unless you're crazy like us. 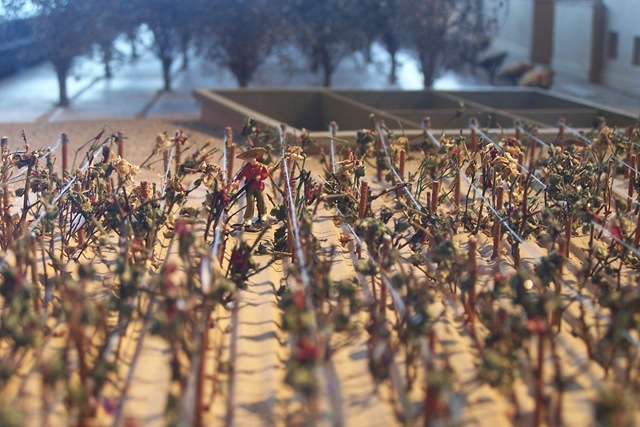 We parked our bikes and walked through an open area gallery that displayed the art of local artists. There was also a big shallow square pool with a statue in the middle, an impressive entrance. We walked in and after 30 minutes of waiting the tour started. If I remember correctly it cost 20 pesos for the tour and the tastings. Their big wine cellar was really impressive even though I thought of the manual work that went into the barrel placement. The rest of the tour was real boring, how many tours can I take? Anyway, towards the end we entered a small room where we were about to taste a couple of wines. We tasted a Sauvignon Blanc and a Pinot Noir. Two lower class wines that they should replace with some of their better ones, I did not enjoy them. After the tour, Tim and I walked around some more and finally into the gift and wine shop. I saw a couple of nice bottle openers so I bought them (my 8th & 9th). We walked outside only to find a small art gallery with local artists work. We walked around and enjoyed the different kind of art that we witnessed. 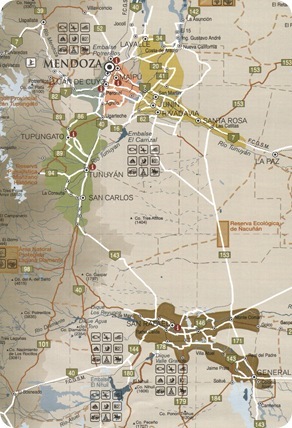 We rode back into Tupungato trying to figure out what other winery we can visit today. 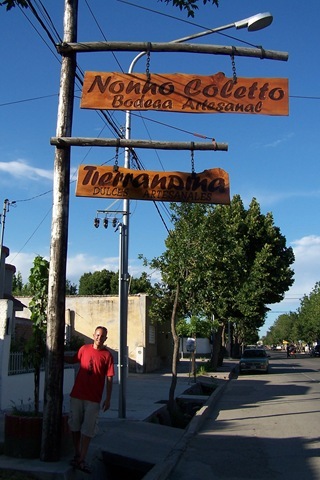 After a stop to rest and a flat tire incident we arrived at Nonno Coletto – Bodega Artesanal. Tim remembered that the person from the information center said that there was a small winery right in the middle of town, so it took us a couple of rides around the block to find it. We walked into a small driveway and looked for the owner. After a couple minutes an older man stepped out of a kitchen and invited us in. 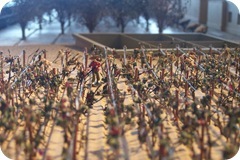 We were amazed and surprised to walk right into the middle of a busy work day. Not only did Sr. Coletto make wines, but also jams, honey, marmalades, and all kind of other sweets as well. We expressed our will to taste some of his wines, and with a big smile he started pulling them out of a cabinet. He lined up 5 reds with similar looking labels. We tasted Sr. Coletto's Prensa Malbec 2007, Eccellenza Malbec 2004, Cabernet Sauvignon 2006, Merlot 2006, and a regular Malbec 2007. The Eccellenza was truly excellent with light oak aromas and flavors of cherry, plum, and black pepper with a smooth and dry finish. Tim and I both enjoyed his Cab. It had nice aromas of vanilla and cinnamon with strong berry flavors. 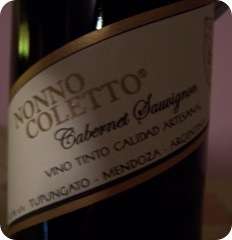 After tasting all his wines and then tasting his Cab once again, we decided to buy a bottle of Cab for dinner tonight. We thanked him for his time and for his great wines and rode back to the hostel. 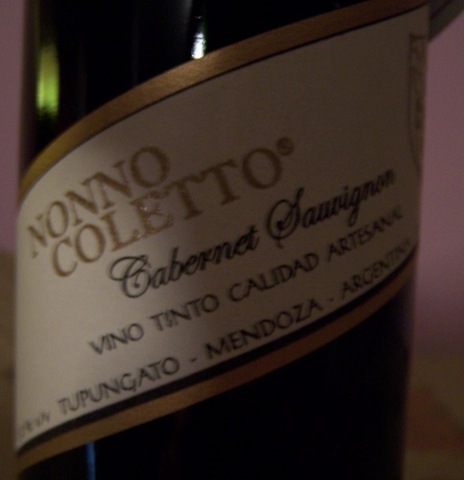 I think Bodega Salentein can learn a few things from Sr. Coletto. Just a bit before 9 o'clock PM we walked around the main street of Tupungato. Tim read about a restaurant called ILO so we looked around and found it. Tim ordered a big steak and I had a piece of salmon together with the Cab from Nonno Coletto. Lucky for me Tim didn't drink a lot so I enjoyed most of our wine, which went quite well with our food. At the end of the night I traded my “Golan Heights Winery” bottle opener with the one that the waiter had (my 10th). What a nice guy. By the time we finished eating and talking about the day that was and the day that will be, it was already midnight. We stepped out into the cool Uco Valley air and took a deep breath. Mothers were still out chatting up and storm, and their kids were still busy in the playgrounds. What a great Argentinian lifestyle. 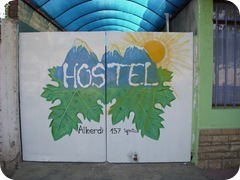 We walked back to our hostel and went to sleep.